Today was a busy day for us. We spent the day making our picture pages to be sent with our dossier. Then we had to make a zillion copies of everything and seperate it all out into piles and staple everything together and check it to make sure it was all in the right order and finally, we made the trip to Fed Ex to send it off to the agency!! It is a huge relief to have it sent. They should receive it by Wednesday so I will call and make sure everything was done right and find out what number we are on the waiting list. This makes everything seem very real. Our next big step will be to receive a picture of our daughter!! This is the season of Thanksgiving and we certainly are grateful for so much. We are so thankful for each other. Our family is the most important part of our life and to have a marriage that is not only surviving but that is growing in strength and joy is truly a blessing. We have this wonderful daughter, Allie, who amazes us with her strength, humor, grace, and intelligence. Most importantly, she is such an amazing young woman of God. Her hunger to grow spiritually humbles us everday and brings much gratitude. 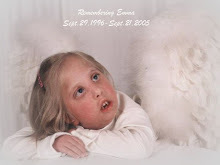 For our memories of our Emma, there could never be thanks enough. And for this daughter we do not know yet, we thank God for providing us with this wonderful opportunity to bring her home. Our friends are beyond words in their support and encouragement as we go through this. Since Emma passed away, we have found who our true friends and family are and there were some surprises, but God has truly blessed us with each one. You guys know who you are and we thank you for everything you have done to make our lives so much richer! Most importantly, we thank God for the amazing gift of salvation and grace. Without that, there is nothing else.